It's fun to make your social media followers envious of your vacation plans and post the perfect beach selfie; we've all done that a time or two. On the other hand, spending too much time documenting your adventures on different social platforms can easily negate that fun in the sun. According to a recent survey conducted by Wyndham Vacation Rentals, 49 percent of vacationers said that social media has negatively impacted their travels. Why? For starters, social media keeps us from being present in the moment. It may keep us from fully experiencing our surroundings, or talking with new people. What's more, on-location status updates, photos, and videos leave us vulnerable to home robberies while we're away. 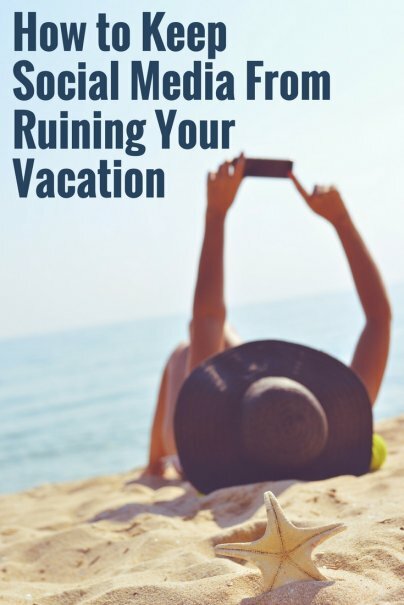 Log off and remember what actually enjoying yourself feels like with these tips on how to keep social media from ruining your vacay. When you're on a glorious trip, the first thing you want to do is tell everybody on social media about it. Fair enough. But by allowing your device's geolocation technology to pinpoint wherever you are around the world, you could be giving the common criminals with whom you're connected the intel they need to rob you blind. Some "friends," eh? "You might as well put a sign in your front yard stating, 'This house is empty for seven days,'" says Justin Lavelle, chief communications director of BeenVerified.com, an online background check platform. "Even though you may make your profiles private, you can't be sure of your entire network, your friends, or your friends' friends." Lavelle recommends waiting to post pictures until after you're back from your trip. Yeah, I know, this sort of takes all the fun out of rubbing your ocean-view suite in everybody's faces, but at least you won't come home to an empty house, right? Just as geotagging can alert evildoers that your joint is ripe for the pickin', selfies taken far from home also send a message to thieves that you're "not in Kansas anymore." So just wait until you've resumed your rightful place as protector of your castle to share your pearly whites and the fantastic places you've been. I took a trip to Canada a couple years ago and I was online for about five minutes after crossing the border. The cost? About $30 additional on my monthly bill for roaming data charges. You can avoid these charges by turning off your roaming and staying off social media while the financial burden is yours. "Using media-rich social networks like Facebook or Instagram, and video-chat type communication like Snapchat, while not connected to Wi-Fi, can use a lot of additional data, which can increase plan costs or leave a customer stranded with no data on their trip," says M. Curtis McCoy, president of Best Cellular. "Make it a priority to connect to your hotel Wi-Fi or free Wi-Fi at restaurants and even gas stations before using these high consumption apps." You owe it to yourself to relax on vacation, so do that. If you really want to check social media while you're away, set a schedule to log on for 15 to 30 minutes in the morning and at bedtime, and stick to it. If there's an emergency, the people who need to get hold of you will get hold of you. Otherwise, sharing cute cat videos and bookmarking recipes can wait until you're back at your desk. If your kids want to read or watch movies on their devices while on vacation — sure, let them. That's what getting away and unwinding is all about. But do they really need access to social media? Take away those devices altogether, or delete the social media apps from their devices while you're on vacation. They're probably gonna whine that they miss their friends, but you're on vacation to spend time together and experience new things going on around you. It might be an uphill battle, but putting your foot down at the beginning of the trip to inform the kids that this will be a social-media-free getaway could be the best decision you make all week. You'll spend quality time together, but most importantly, they'll have fond memories of the vacation for which they'll thank you later. It should go without saying that you need to be conscious and careful of what you post on social media while on vacation, especially in foreign countries. Laws vary widely around the world, and what you think of as innocuous could very well land you in a foreign jail. McCoy recommends, when in doubt, check with locals before posting images of religious or historical landmarks. "Your innocent selfie could be a huge offense against their religious practices, traditions, or beliefs," he says. Furthermore, travelers should not take or share pictures of military or government personnel in certain countries. Always ask first, or just decide that you can totally live without that photo or video. I'd recommend the latter.